Land Rover makes millionth Discovery | What Car? The millionth Land Rover Discovery rolled off its Solihull production line this morning. Land Rover's milestone Discovery was displayed alongside the first example of the off-roader, before it set off on a 50-day, 8000-mile journey to Beijing in China. The Land Rover expedition is hoping to raise 1 million for the International Federation of the Red Cross and Red Crescent Societies. 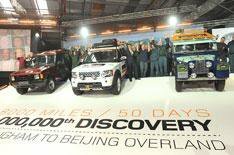 The route to China will take the Discovery through 12 countries before arriving at the Beijing motor show on April 23. Despite the enormity of the trip, the car is remarkably similar to the one that a customer could buy in the showroom. Despite a planned expansion of the Land Rover range, any future version of the Discovery must continue to appeal to the same type of buyer, according to Popham. You can sponsor the Discovery team and help support water sanitation projects in Uganda at www.landrover.com/million.